Today’s gamers demand extreme power and unsurpassed performance from their systems. And with the new Dynapower EJ-850A80, these demands are met to the extreme! With a whopping 96 Amps on 4 x 12V+ rails and auto-switching capability, there has been no easier way to upgrade your system to maximum performance. It is equipped with the all of today’s standard features: Silent Fan Speed Control, Active PFC, EPS12V Compliant, and 80 Plus Bronze Certification because of its superior performance during efficiency testing, so you know that it is a "green" product and earth-friendly. The EJ-850A80 features new "modular" cabling to reduce cable clutter and is Dual CPU / Quad CORE Ready. The unit is also NVIDIA SLI™ / ATI Crossfire™ certified and is equipped with 4 x 6+2-Pins connectors as well as 8 x SATA connectors for ultra connectivity. The EJ-850A80 80 Plus unit meets the demands and exceeds the expectations of the extreme gamer and keeps the competition lagging behind. Input Voltage : 100V - 240V. 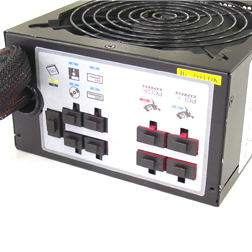 Input Current : 115Vac / 12.0A ; 230Vac / 6.0A max. Inrush Current : 110A max. When AC input 230Vac at 250C cold start. Input Frequency : 47Hz~63 Hz. Leakage Current : 3.5mA max.